nsxtasy wrote: Today I bought a couple of kouign amanns, including the one pictured below, at Cellar Door Provisions. This post on the kouign amann thread reminded me to commend CDP for their chocolate walnut scone I had earlier this week, as well as their scones in general. I frequent the place for pastries to go with my coffee, and their scones are consistently phenomenal, especially considering that isn't a pastry that typically evokes superlative praise. Much moister than all other options (Alchemy Coffee in Wilmette is the only other place in the same league for scones). As was the case with almost all CDP pastries, the restrained sweetness makes the dish. Don't think twice about stopping for pastries when in the area from 8-11am! First visit to CDP last nice and I loved it. The menu was very vegetable focused, which was awesome. Went with a buddy and didn’t ask for any changes with the menu, but the server said if you request a vegan or vegetarian meal when you make reservations, they will try to accommodate, so will have to go back with my wife. Nice feeling space. The older I get, I love being able to get a great, fine dining meal in a more casual environment. And gotta love BYO! Really enjoyed the entire meal. I have never met a beet I didn’t love, but will say without the yogurt, the beets would have been too smokey for me. But with the yogurt and seeds, very nice. Very nice course, good combinations. Great to see fiddleheads on the menu. I really liked the texture of the gnoochi. Subtle, but satisfying dish. We split this course, my least favorite dish, but my friend loved it. Wow, what a delicious desert, loved that it was not overly sweet. While they have nice looking stems, they are on the small size, so glad that I brought my Riedel Pinot O’s for the 2004 Giovanni Corino Barolo, which was a bit too modern for me. We've continued to enjoy dinner on a regular basis at CDP; about once a month. It's always exciting, interesting and delicious, and this time of year, it's downright magical. This past Friday might have been my favorite dinner there so far. With the exception of 1 supplement, the entire menu was vegetarian. $42 gets you four courses and in this iteration, that was a lot of food. Nevertheless, we shared all 3 of the supplements, which rounded out the meal nicely . . . 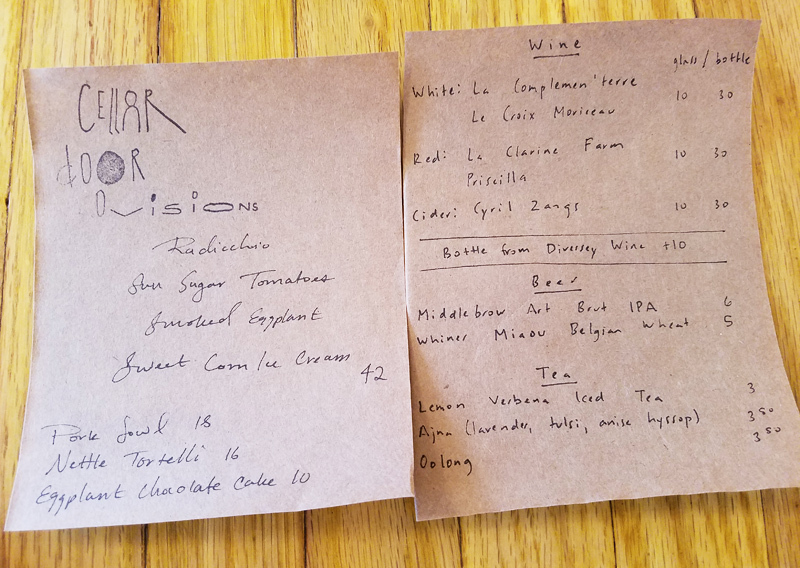 The menu conveys perfectly the impending experience . . . straightforward, genuine and inviting. 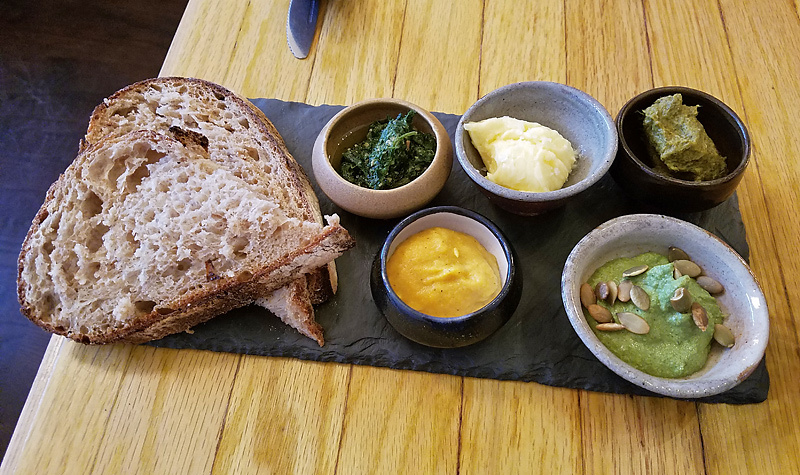 House-baked bread and an array of snacks, including cultured butter, garlic scape puree, golden beet puree and country pesto. I'd never seen green radicchio before but here it was. 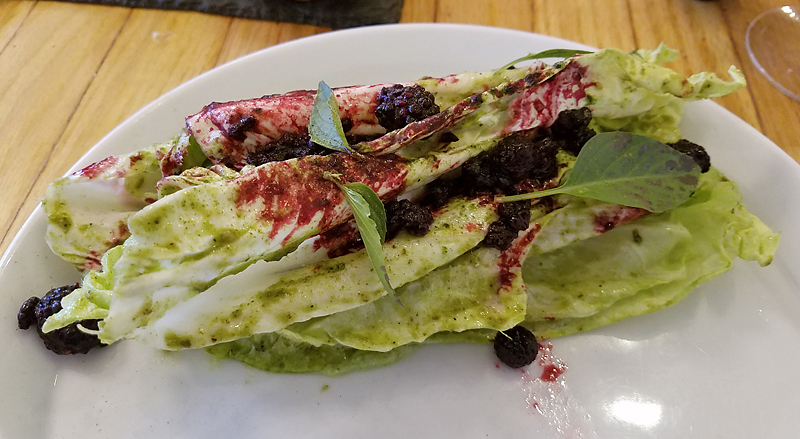 I loved the black raspberries, which foiled the bitterness of the radicchio very nicely. There was also a delicious, mildly-spicy green dressing/puree that pulled it all together. This was one of the best salads I've had in a long time. This unctuous roasted and fried jowl was a supplement, and the only dish we had that contained meat. Wow, was it spectacular. The meat was delicately crispy on the outside and packed with fatty pork flavor within. There was also a dressing that was amped up with anchovies. 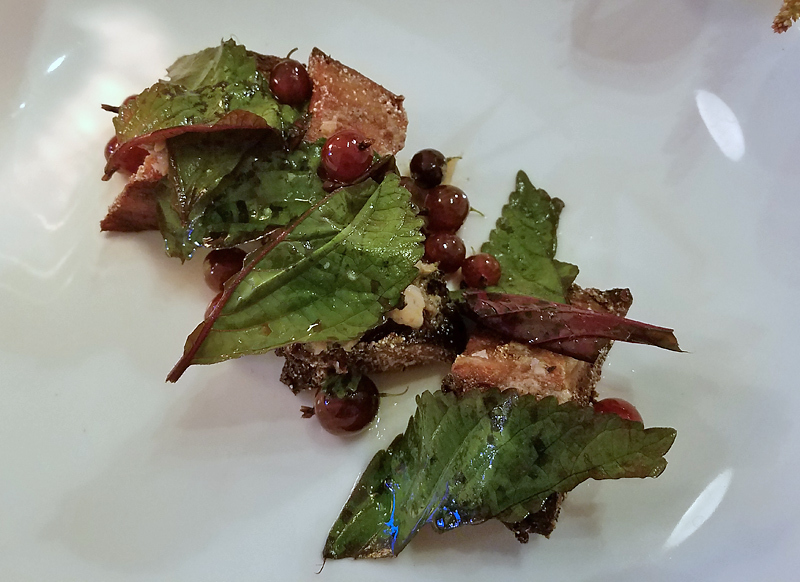 The dish also featured gooseberries and shiso leaves (iirc). These grilled eggplants were tender on the inside and small enough so that their crispy skin could really be enjoyed. They were very smoky, and came together with the other components to form a kind of pre-constructed baba ganoush. 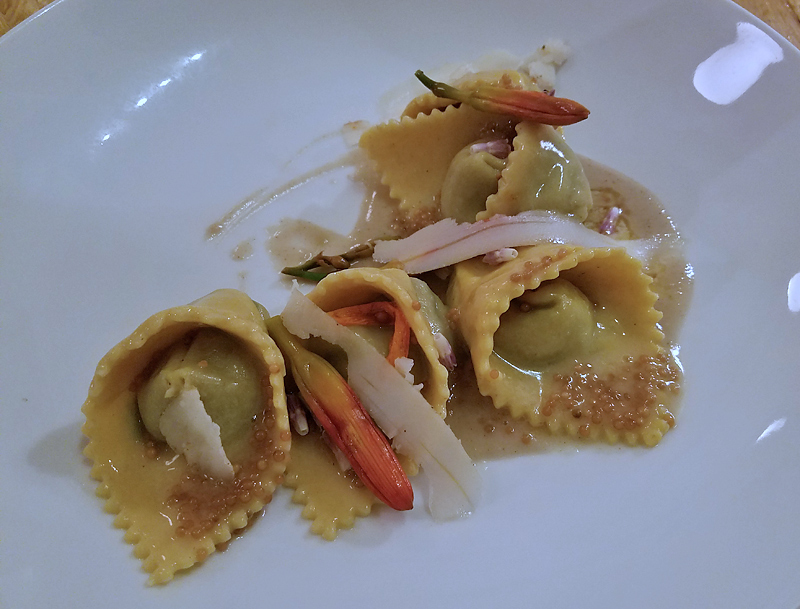 Perfectly al dente pasta -- and look how beautiful the tortelli are. The nettle filling was really well executed. This super rich and creamy ice cream struck a great balance between sweet and tangy. It kind of reminded me of cheesecake, with the crumbles and ground cherries balancing out its richness. We were told that that this was more or less an experiment, and I'd actually heard some folks talking about it in the neighborhood earlier in the day. I didn't love it but I appreciated the effort. 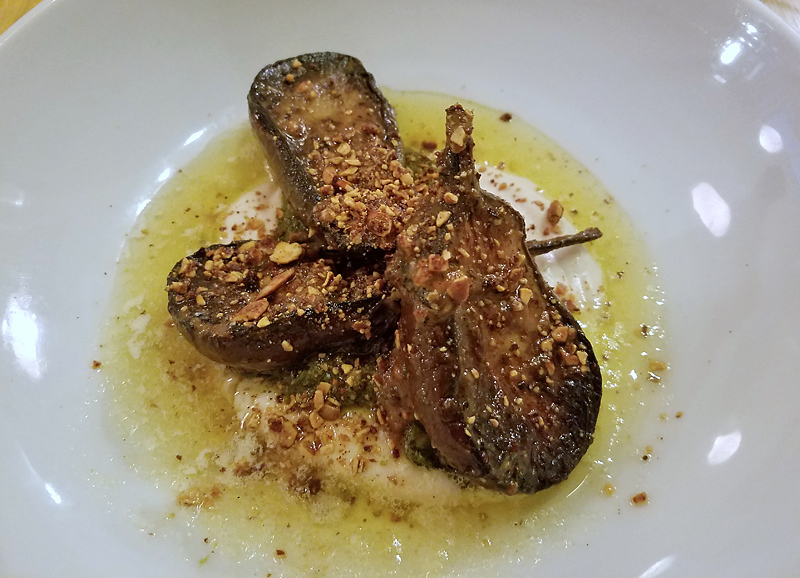 The flavor was reminiscent of matcha --which can pair nicely with chocolate -- but unlike with the savory eggplant take earlier in the meal, the somewhat fibrous texture of the eggplant in this dish put me off. If anyone could have pulled this off, it would have been this kitchen, which can generally do no wrong. I'm glad I tried it but I probably wouldn't order it again. One other note: they have acquired a liquor license and are no longer byo. However, Diversey Wines has opened in the space next door to the east, and bottles purchased there can be brought into the restaurant for a $10/bottle charge. Additionally, a few selections from the shop, both beer and wine, are available to order in the restaurant. Wines are available by the glass or bottle. If you haven't had dinner here, you're missing out. For a number of reasons, this is one of the best dining experiences you can have anywhere in town. There is an inescapable and compelling philosophy on which CDP operates. That philosophy governs every bit of food that comes into the establishment, how it's prepared and served, the way diners are treated during their meals and the way they feel after they've left. In a word: special. Agreed. The food here is so thoughtful and delicious. They can accommodate any diet, which is nice too. Looked at the recent dinner menu and it is from 11/16-11/17 and a la carte. Haven't been since the summer, but have they changed formats from a prix fixe meal to a la carte? I called, but they are closed until next Wednesday, 11/28. Wanted to make a reservation, but Reserve is requiring a $25 per person reservation fee and wanted to know the format before I committed. I attended the second night of the a la carte format and really enjoyed it. The menu is still showing on line. There are 7 choices in three courses, plus a bread option and two desserts. Since we didn't feel like choosing, we just asked the server (who happens to be my daughter) to bring us dinner. We ended up trying everything on the menu since there were four of us. The overall cost was not much more than their prix fixe dinner. Everything was at least good, and a few of the courses were outstanding (particularly the rabbit course). In addition, a simple (small) bowl of beans was very luxurious. 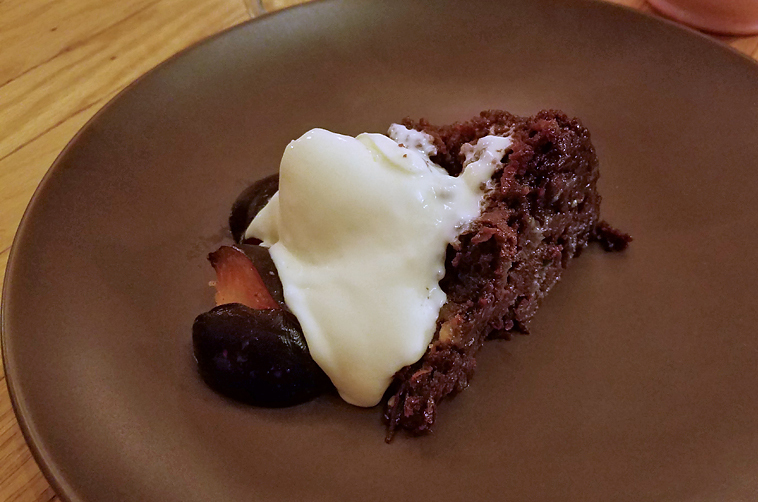 This particular menu was a little more meat focused than usual as it was part of an Italian wine themed dinner and better complimented some of the wine choices. The desserts were very good on their own and even better when mixed together. It is my understanding that they will be keeping the a la carte format for the forseeable future. If you like Cellar Doors food, I don't think this change in format is a major change in the overall experience (except I did really like the opening course of small dips and pickled items, etc). in an email, Emily at Cellar Door Provisions wrote: Like, to be honest I feel like everyone saw this coming. I mean the likelihood that "temporary super fun a la carte dinner" would actually stay temporary once we fell in love with it? Doesn't sound like Cellar Door logic. So yeah, our dinner service is now a la carte. 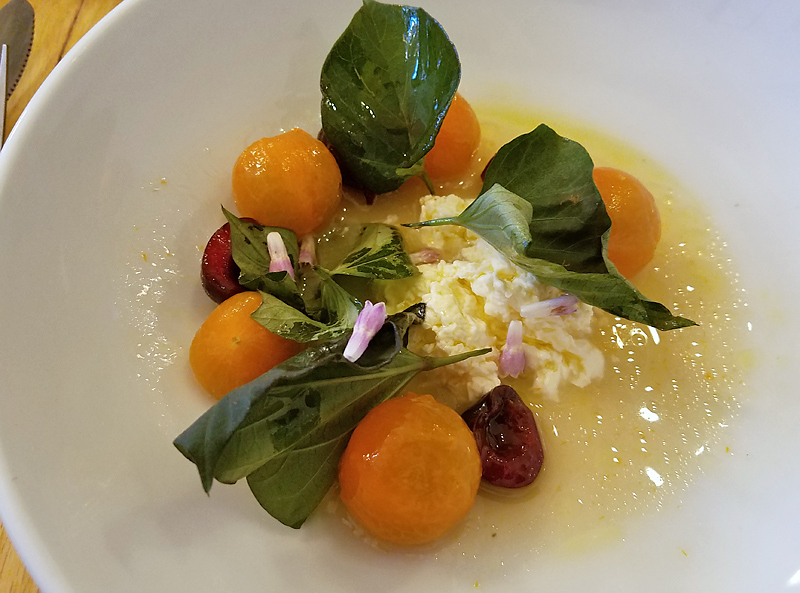 And it's not like we've actually only been prix fixe, we've broken dishes out of the menu for families in a hurry, folks eating a few dinners, and most recently, snack time. It always feels so much better to say "Yes you can eat here in the way that is nourishing to you right now" than "Please sit down for 2 hours because that's what we do here." It's better for the energetics. And if there's one thing the entire crew is always conscious of it's the energy in the restaurant. I think vibe commentary just edges out the food talk. So we're all considering this an investment in the vibe, in being able to hold and take care of more people. Or maybe just like one person cycling through a few different moods. And definitely my dad. The nice thing about this change is that it's not a huge shift. If you like the ease of sitting down to prix fixe and not worrying that's fine, we'll order for you. In fact I would love to, always have a few different menu configurations in my head that I want to see come to life for someone. And snack menu is even better because now we just serve a longer menu of different sized snacks. We're open this month through the 23rd before winter break round 2. So come say hi, would really appreciate blessings moving into this newnew iteration of the restaurant. Can make reservations here but happy to say that walking in also just got a little easier, especially if you're down to hang with our next door neighbors for a second. Ok see you soon. Every single sentence of that makes me think, what the foxtrot?!? How people get out of high school these days I just don't know. Katie wrote: Every single sentence of that makes me think, what the foxtrot?!? How people get out of high school these days I just don't know. Congratulations. This wins the award for the most ignorant post of 2018. Bravo! The perils of having never been to a place and posting about it with zero context. I don't think either of you cared to try to understand my point. I didn't comment on Cellar Door Provisions. I commented on how someone communicates in the English language. On that point, I don't need lessons from either of you, but the person who wrote the email Ronnie quoted has a lot to learn. Katie wrote: I commented on how someone communicates in the English language. I doubt the quote would pass muster from The Chicago Manual of Style. It's funny. I read Emily's email above and it left me wishing that I could communicate in writing more effectively. It really captures the spirit of the restaurant. It's not just because she is my daughter. Katie read it and decided to contribute something snarky and add no value. Well done, Katie. You can return to your cave now. I think a business should be concerned with the various aspects of the image it presents to the public, including its communications. Obviously, though impressions are subjective. If the moderators want to delete my post, that's fine with me. The email is pretty clearly written to convey the voice of the restaurant, so your point is mostly, "There is only one proper way to use the English language." Seconding Gnarchief. Grammar and style are situative, reflecting the medium, purpose, relationship, et al. of the communicators; most everyone understood--and found endearing--her message. More than anything, I wish I got more emails like this from restaurants. Frankly, I wish we had more restaurants like CDP. Thanks for sharing! If there's a bummer here about the whole thing, it's that they no longer do that opening breads-and-spreads course--that zhug they made was dabomb.com. gnarchief wrote: The email is pretty clearly written to convey the voice of the restaurant, so your point is mostly, "There is only one proper way to use the English language." Exactly what I was thinking. Of course, one would have to have actually been there to know that. Context is unendingly valuable. I always appreciate how Emily's email voice mirrors the vibe of the restaurant. Katie wrote: . . .the person who wrote the email Ronnie quoted has a lot to learn. And so, apparently, do you. What do you know about managing a restaurant? Far less than Emily, I'm sure. Is it your learned opinion that the style in which this email was written would have any bearing at all on the operations at Cellar Door Provisions? Would it keep the room running efficiently during a busy service? Would it help a customer who had to wait beyond his reservation time feel good about his experience? Would it pair a beverage to a particular course? As others have posted, this wasn't a thesis, dissertation, treatise or official document. It was intended to be a fun, informative, sincere and casually-toned email message to a group of people, fans of a restaurant, who've chosen to receive it. It's unlikely one would ever receive this email if they hadn't been to Cellar Door Provisions and enjoyed their experience there. In any case, I guess I won't be running into you there any time soon. chezbrad wrote: If there's a bummer here about the whole thing, it's that they no longer do that opening breads-and-spreads course--that zhug they made was dabomb.com. Agreed! Loved their awesome spreads with the phenomenal breads! I also appreciated seeing the email. Didn't know there was an email list, will ask to be added to it. Okay. You have persuaded me that I was out of line. Katie wrote: Okay. You have persuaded me that I was out of line. We enjoyed another wonderful evening at CDP yesterday. They had a full house for the second weekend of the new format. As usual, everything was beautifully presented and warm, friendly service. Ordered all of the non-dessert except the cured trout. 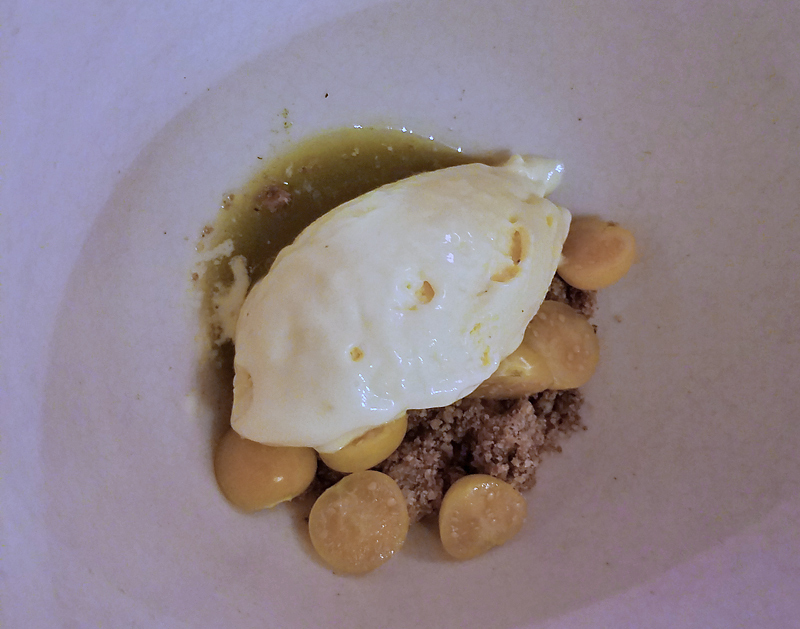 Enjoyed every dish, but the standouts for us were the dish of white beans, bergamot, and tonnata, which were perfectly cooked, just barely firm. The celery root, persimmon, koji, and pecan 'salad'. An insanely aromatic and rich potato gnocchi, mushroom, with pickled greens in a deeply flavored broth. And the roasted squash tartine, apple, and pepitas. We also had a trio of sorbets, matcha, beet, and chocolate. The beet was amazing, our favorite. Walked into Diversey Wines and grabbed a nice Vini di Giovanni Rozzo from Umbria, 90% sangiovese and 10% montepulciano. Here's a unique opportunity for haters of multiple shades. On Monday February 4 (from 5-9 pm), Cellar Door Provisions will be celebrating its 5th Anniversary with a pizza party at which Nick Lessins and Lydia Esparza of Great Lake Pizza will be in the kitchen. ronnie_suburban wrote: Here's a unique opportunity for haters of multiple shades. On Monday February 4 (from 5-9 pm), Cellar Door Provisions will be celebrating its 5th Anniversary with a pizza party at which Nick Lessins and Lydia Esparza of Great Lake Pizza will be in the kitchen. Julia Kramer has posted an excellent piece about Cellar Door Provisions at Bon Appetit's website . . .
at bonappetit.com, Julia Kramer wrote: I have a lot of thoughts about Cellar Door: about why it’s my favorite restaurant in Chicago, about why it’s significant that it’s in Chicago, about how it rejects and rethinks so many deeply ingrained aspects of restaurant culture. But I think the quiche—both in its greatness and in its limitations—makes the clearest introduction to the very particular mentality of this restaurant.